The ends of the Pexgol pipe are heated and then flared by a proprietary process, performed at Golan Plastic Products. The final pipe end is similar to a stub end. Flared ends can be also be made at the ends of Pexgol elbows, reducers, etc. The loose flange is usually mounted over the pipe at Golan during the flaring process. Alternatively, split flanges can be supplied and mounted later. The flanges are available according to the table “Compatibility of Pexgol Flanges”. Flanges that conform to different standards are available by special request. Detailed drawings of flanges are supplied on request. Plastic coated flanges are available on request. Chemical resistance, UV resistance and lifetime of flared ends are the same as the pipes they are part of. The flared sealing faces should be protected. Otherwise no additional storage conditions are required. Pexgol flared end pipes are available in lengths according to customer specifications. They are also available in lengths of 5.80 m to fit into 20 ft containers or in lengths of 11.80 m to fit into 40 ft containers. The elbows with flared ends are available from our catalog according to specified length. Pexgol flared end pipes are available in minimum lengths according to the following table. 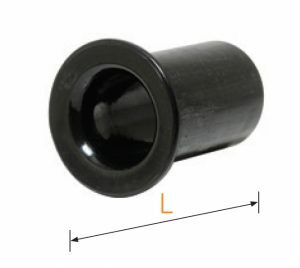 The catalog number in table represents a Pexgol stub-end that is a Pexgol pipe class 15 spool with a standard length of 500mm and with a flared end on one side. For example – FLA16014.6 means pipe section 160mm, wall thickness 14.6mm, and length 500mm. For sections shorter than 500mm, use the length L in the table. If a different wall thickness is required or a longer section is required, or flared end on both sides, or the section should be supplied with loose flanges, please specify according to the following example: for a pipe section 160mm, wall thickness 14.6mm, length 2500mm with one flared end & flange – FLA16014.6 2500mm with flaring and flange ASA 150 on one side. Please refer to our fitting catalog where the full range of fittings is available.